What Is The Key Role Of A Spark Plug? - Muscle Cars Zone! Sometimes, the most important things are the ones being neglected, just like spark plugs. Because it`s often overlooked, car owners aren`t always able to replace the spark plugs when needed—at least not until they give up. These plugs have a significant purpose in starting the engine of your vehicle, as well as to keep it running. In short, if your vehicle doesn`t have spark plugs, it`s useless. Spark plugs are insulated plugs that deliver a spark that ignites the mixture of fuel and air in the combustion chamber. These plugs are screwed into an internal combustion engine`s head cylinder. Spark plugs have one end that conducts electricity in order to make a spark on the other end. It will create a combustion and fire up your engine when the spark has ignited the air and gas in the cylinders. For your engine to continue running, your spark plugs will keep on igniting and firing. These are very important because without them, your car`s engine won`t start. Though they may be small, these are essential to keep your car in tip-top shape. 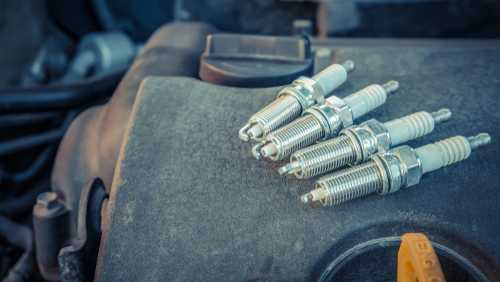 Spark plugs can also be a heat dissipator because of its ability to transfer heat into the car`s cooling system, which is based on the insulator nose`s length and the materials used for the insulator and the center electrode. Knowing the leading types of electrodes used in your spark plug can be a great advantage since each type provides different power levels that can help you use your fuel in a more efficient manner. This is the most common type of electrode, especially in modified engines. They conduct better electricity than other types of electrodes, but have a short life span. This type of electrode might need changing every 20,000 miles or so. Compared to the copper alloy, the iridium alloy can last twice as long. This is more durable, with a 2,500°C melting point. If you use this in modified engines, remember that their conductivity is lower than copper alloys. They are also long-lasting and super resistant to time-borne corrosions. It`s recommended for new vehicles with ignition systems that are electronic distributor-based. If your car has 4 cylinders, it should have 4 spark plugs. If it contains 6 cylinders, then it should have 6 spark plugs. However, if your engine is a Hemispherical V-shape, then 2 plugs should be placed on each of its cylinders. It has a copper center electrode core with nickel alloy surrounding it. The center electrode is covered with porcelain, which helps in transferring heat from the engine onto the cooling system. This uses iridium or platinum instead of nickel alloy because it has higher melting points. However, it is more expensive than standard ones. It`s commonly used for luxury or sports cars because it is more durable and has a high-igniting performance. This can be found in standard engines. Since it has more insulation, the extra insulation will keep the temperature of the plug high enough so it can burn the deposits of carbon. It works best in high-compression and high horse-powered engines. More heat can be transferred away from the combustion chamber if a cold plug will be used because it has less insulation. When can you change spark plugs? Your car has difficulty starting as your spark plugs might already be dirty or soiled. Your car is idling roughly. If you`re filling up your gas tank more often than you used to, better check your spark plugs. This might be the reason why you have an increased consumption in gas. Your car`s performance becomes poor. The key role of a spark plug is to keep your engine running, so it`s important to have enough knowledge about spark plugs, its types, the electrode type that suits your engine, and signs when replacement is needed. If you encounter faulty spark plugs, you can call a professional mechanic to replace them or visit the nearest car service center once you`ve seen signs that your spark plug is already worn out.